"Our entire herd has been born & raised on our farm, and most of our cow "families" have been with us for 6 or 7 generations." Crosswinds Farm & Creamery is home to Brown Swiss dairy cows, crossbred pigs, and a flock of several breeds of egg laying chickens. The comfort and health of our animals is our top priority; they are our four-legged (and two-legged) family. We handcraft a portion of the milk that our cows produce into delicious cheeses. 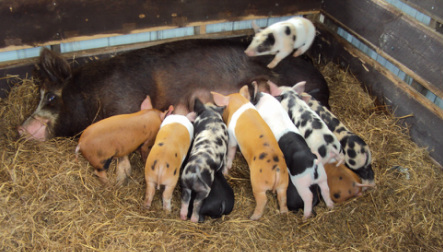 Our pigs feast on the whey that is a by-product of cheesemaking, producing tasty pork. There are typically 125 cows here, of one age or another. 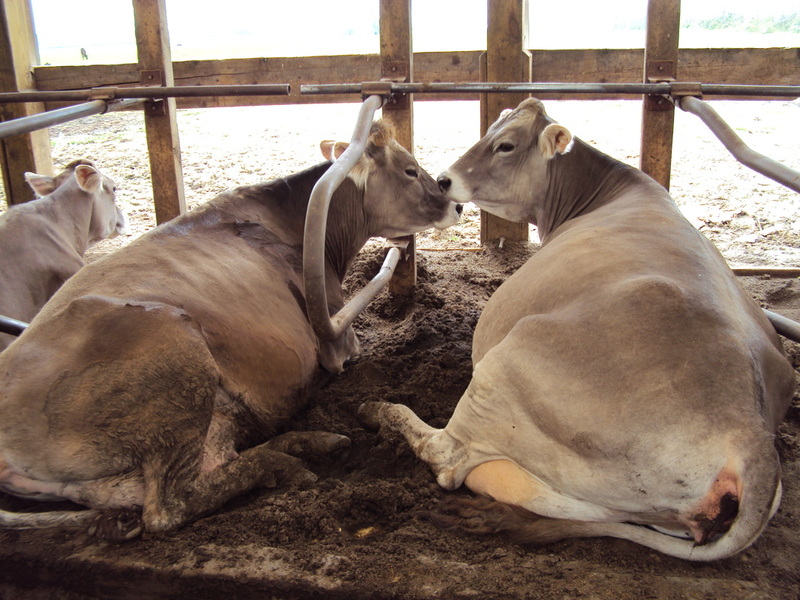 They are mostly brown (Brown Swiss) with a few black & white (Holstein) or some combination of the two, which might range from nearly black to chocolate to orange. We started farming in 2003 with a small group of Brown Swiss and purchased a group of Holsteins. We love the Swiss for their higher protein milk, great feet & legs, ruggedness, low somatic cell count (this means they produce higher quality milk), and docile personalities (generally speaking). Wanting a herd with more Brown Swiss, we’ve crossbred our Holstein cows with Brown Swiss bulls, and continue to breed these animals back to Brown Swiss. Today, about 95% of the herd is Swiss, which is really exciting to us! Our entire herd has been born & raised on our farm, and most of our cow "families" have been with us for 6 or 7 generations. They all have names, and we know (and love or hate) each cows' individual personality. It is not uncommon for our cows to live 7-10 years, which is well above the industry average. To me, this is the best evidence that our cows are well cared for. A Coverall (hoop) barn houses our cows and our milking parlor. It’s not your typical big red barn, but it has big advantages. Light shines through the fabric cover, so it’s very pleasant and we have little need for artificial lighting. We open the sides completely for at least 8 months of the year, which makes the “barn” more like a giant shade with fresh air moving through it all the time. The cows have custom-sized stalls bedded deep with sand and are free to roam around; to eat, drink, sleep and socialize as they choose. Our dry cows have a separate pen – they’re not thirsty cows, that is how we refer to cows when they’re on vacation from milking for the last two months of their pregnancy. The younger “teenage” animals who have not yet calved, or heifers, are housed in groups by size. 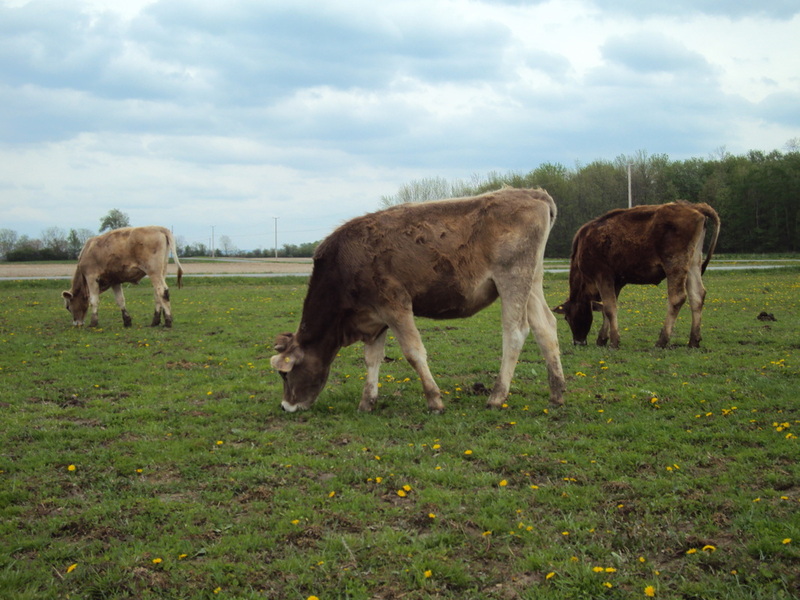 Our animals eat pasture and feed that we grow or purchase from other local farms. We lease 130 acres of cropland which is seeded to mixed grasses or other forages like millet or sudangrass. The grasses that we harvest are either baled as dry hay or wrapped as baleage which preserves the nutrients for feeding outside of the growing season. In 2011, we adopted a new system for raising our baby calves. They are housed in groups and have milk available 24 hours a day, so they can eat whenever they are hungry. 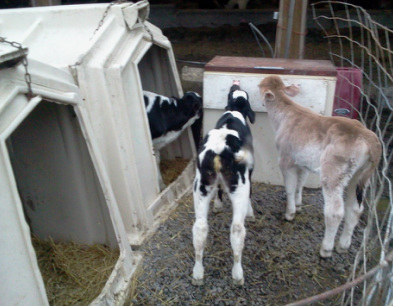 The calves grow really well in this set-up and stay super healthy! We use antibiotics only when absolutely necessary, which is rarely. We have a lot invested (emotionally & financially) in our cows, and we want to give them the best medical care available, if they need it. Balanced diets, vaccines, fresh air & water are our preventive health strategies. If a cow is treated with antibiotics, her milk is of course discarded until the antibiotics have cleared her system. Every tank of milk is tested for antibiotics before processing. We do not use rBST, although there really is no difference between the milk from cows that are supplemented and those that aren't. (That will be a topic for another day). Nearly all of the materials used to build our farm have been recycled in one way or another. 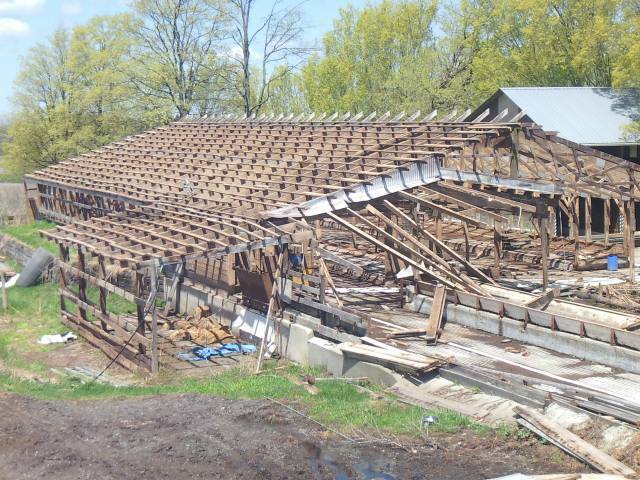 In 2011, we "deconstructed" the barns at another farm & hauled all of the materials home. 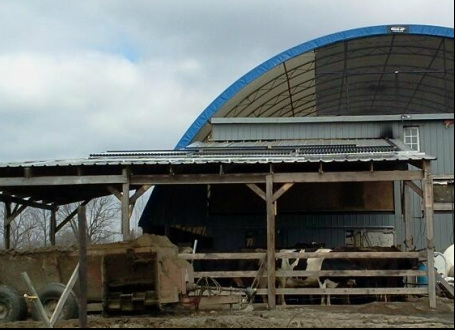 We are planning to resurrect the main barn to give us more space to house our animals, and have used many of the other parts & pieces in our projects, including building a roof to mount our solar thermal hot water system on. We love using the sun to heat the 200+ gallons of hot water we need daily for the dairy! We also recycle all of the plastics used on the dairy.